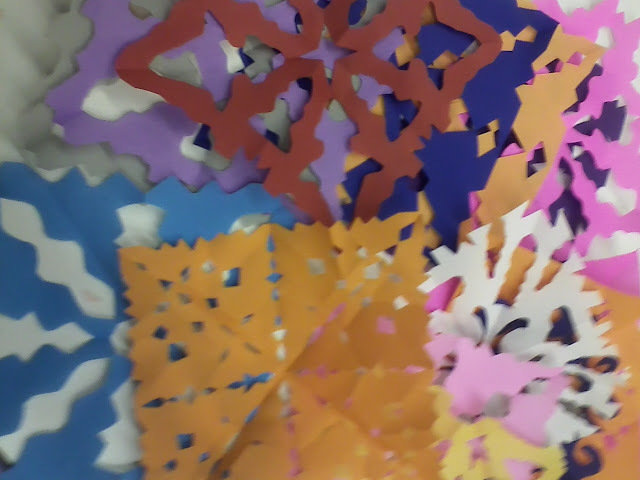 Here are some of the colorful snowflakes my teen volunteers made for the kids at Sandy Hook Elementary. You can make some too and send them there (this is one of the projects being sponsored by the Connecticut PTSA). It's something small to do, but it's still something. I wish everyone a safe and peaceful holiday. Yesterday, as I was leaving the library, a kid I know stopped me to say hi. (She’s about 12 and has said to me in the past: “You’re my best friend…in the library.” I appreciated this even WITH the qualifier.) She gave me a hug like she always does and I asked her how she was doing. She kind of looked down at the floor, nodded, and said “I’m okay.” I immediately grew concerned. My heart kind of dropped and I steeled myself for a conversation about Newtown, family trouble, school troubles, or any of the above combined. I would say the right thing. I would be there for her. I would get her help if she needed it. I let out the breath I’d been holding and almost laughed with relief. She was okay. I, on the other hand, have been a bundle of electric nerves and raw emotions since Friday. There is no sense in tragedy. There are no lessons to learn, except maybe these: to give love (or at least kindness) freely, to listen to those around us and let them know that they are heard and understood. I do what little part I can in the world around me - even if it’s just listening to a lamentation about a favorite television show ending. You never know what’s important to someone. You never know what will matter until it’s possibly too late. Look what my nice friend over at Forgotten Bookmarks sent me! Yes, that is a classic 1987 vintage mint authorized collectible (I have no idea how to describe trading cards) Garbage Pail Kids trading card. I had a bunch of these when I was a kid, but I'm pretty sure my mom surreptitiously threw them out because some of the themes were pretty gross/disturbing (by 1987 standards, anyway). I'm not sure what the story is behind poor ol' "Screwey Dewey," but I'm just going to imagine that Dewey here is a librarian who had spent too many hours on the reference desk because his branch was short-staffed thanks to budget cuts (ahem). One day after work, Dewey was walking through a very industrialized part of town. He was so stressed and exhausted and distracted that he didn't see the giant pair of cogs in the sidewalk ahead and he fell into them. By coincidence, he was still holding the wrench he had used earlier in the day to fix the library's broken toilet (the custodian was substituting at another branch - again, budget cuts). Dewey tried to stop the cogs with the wrench, but they were too fast. His skull was crushed within seconds and he died. Hmmm. 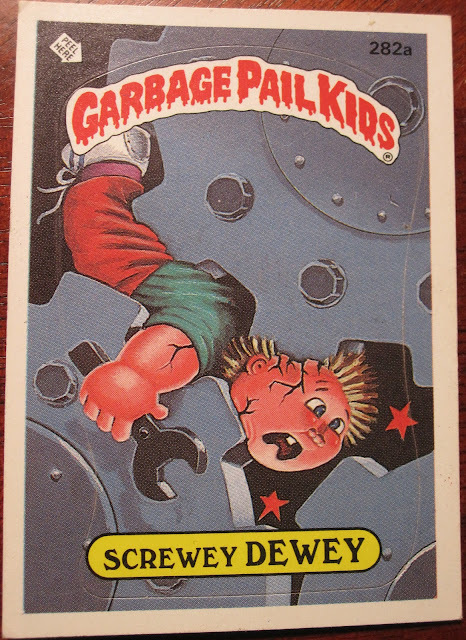 Now I see why my mom didn't want me to have Garbage Pail Kids. In any case, it's obvious that Dewey has fallen on (or in?) 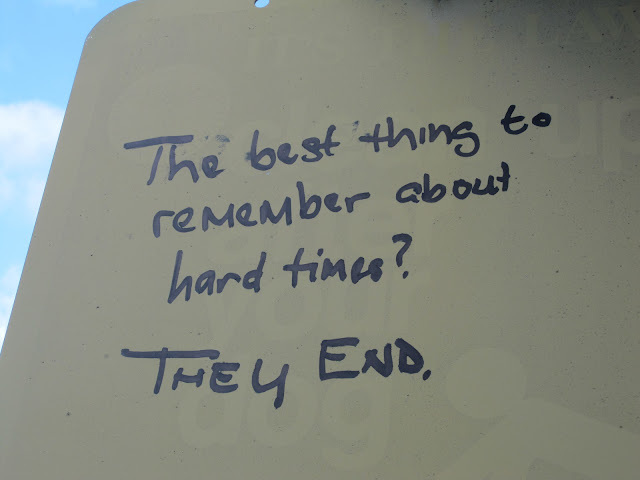 some tough times and could use a little positive reinforcement. 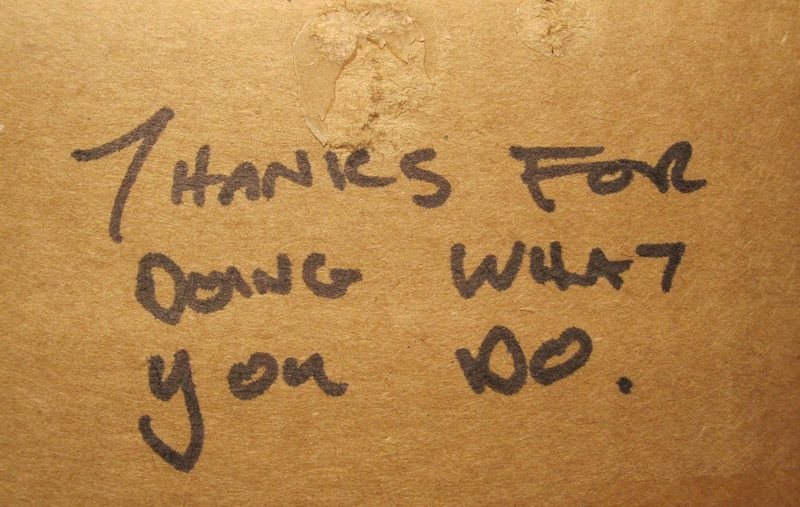 Speaking of which, there was a succinct but lovely little note on the package I received. 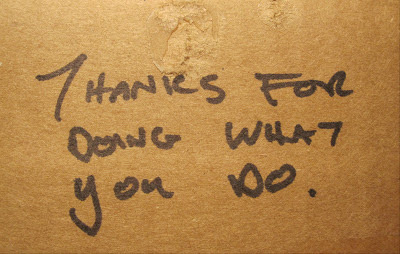 As we all know, being a librarian is often a thankless job, so it's nice to hear this kind of thing every so often. Thank YOU, Forgotten Bookmarks! You are awesome. Edit: I just learned he found it in a book, which makes it even cooler. Now let's see how much money I can get from selling "Screwey Dewey" on eBay.